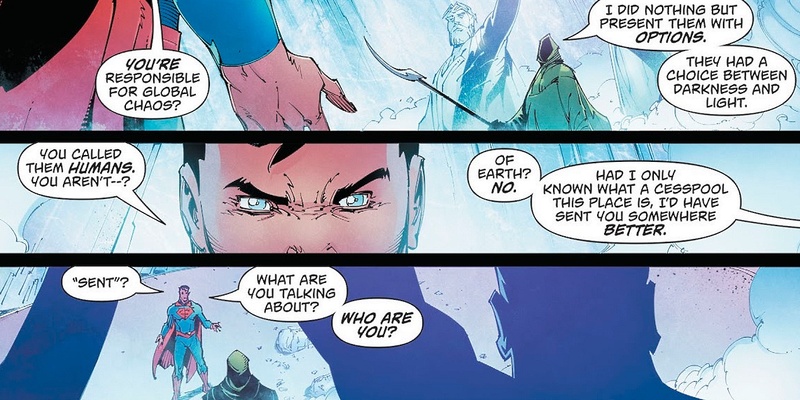 It's the moment that Superman fans have been waiting for since before DC's REBIRTH - the true identity of the mysterious "Mr. Oz." has finally been revealed. And as some fans suspected, the unseen watcher of "Rebirth" event and beyond doesn't hail from Earth, or quite possibly even this universe. All we know is that he hails from the planet Krypton... and that DC Comics has just pulled a MASSIVE twist on the foundation of Superman's origin story. The long-awaited reveal finally comes in Action Comics #987, on sale now, with writer Dan Jurgens having been teasing the reveal for weeks, months-- since the very beginning of DC's Rebirth when the shadowy, cloaked figure obsessively watching the Man of Steel made his introduction with the Wizard of Oz reference. Soon came the faked death of Red Robin, the kidnapping of Doomsday, and too many other sinister, mysterious deeds to count. It's all been leading to "The Oz Effect," when Mr. Oz's plan is finally launched, bringing him face-to-face with Superman - and finally pulling back the hood to reveal his TRUE identity. But before we get to that massive SPOILER, Mr. Oz's plan helps set the stage. 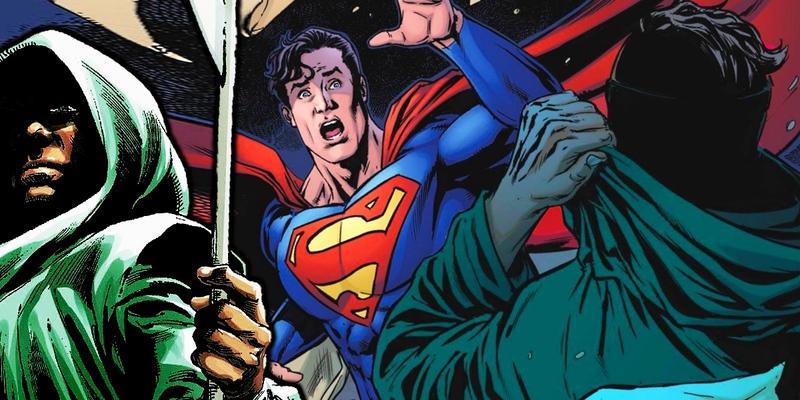 Those who read the previous issue were given a major hint in Action Comics #986's shocking ending as to Mr. Oz's true alien heritage, if not his explicit identity. Showing up to demand Lex Luthor erase evidence he had found of Mr. Oz's meddling with humanity, he put the billionaire in his place by revealing himself to be even smarter (and the added technology of teleportation can help anyone outsmart Luthor's defenses). But the real clue was the blast of heat vision Mr. Oz unleashed upon Lex, leaving him a whimpering mess with one final message: that he would never be Superman. Not because his heart wasn't in the right place, or because he was unworthy... but because Lex was simply human. The scene left no doubt that Mr. Oz's past comments about Earth, and the people existing close to and in need of Superman were meant to be even more venomous than it had seemed. But with Issue #987, Mr. Oz shows how far he's willing to go to prove humanity's weakness, hatred, lust for violence, and generally inferior nature. And prove it specifically TO Superman - for reasons that, at first, make little sense. Using his sleeper agents planted around the globe to spark natural disasters, prison riots, workplace shootings, and armed conflicts in African villages (among others) all at once, Superman is unable to save everyone in danger. When the Man of Steel witnesses the willingness of humans to murder one another with no thought of civilian casualties, he is at his lowest point in recent memory... which is exactly when Mr. Oz reveals himself. The impression that's been given from the very first appearances of Mr. Oz was chilling given the fact that he could exist outside of Superman's awareness. And with every appearance, the hints and suggestions got stranger and stranger: Mr. Oz knew that this Superman was not the version older fans knew. He watched as the classic Superman and the New 52 Superman merged into one form. And even though Clark Kent didn't realize it yet, Mr. Oz knew that DC's reality had been rewritten as a result. And fans should keep that notion - the collapsing, resurrection, and integration of DC characters from before and after the Crisis reboots - in mind as we reach the reveal of Mr. Oz's true identity. Because once the mysterious figure transports both himself and Superman to the latter's Fortress of Solitude, he can explain the purpose of his mission. In short: to reveal that humanity is not worth Superman saving. That Superman being sent to Earth before Krypton's destruction was a mistake. And considering Mr. Oz's identity, his opinion actually carries serious weight. That's right, 'Mr. Oz' has actually been Jor-El, Superman's Kryptonian father this whole time. The aforementioned bout of heat vision and condescending mention of "humans" had some fans wondering if the Martian Manhunter was the culprit, or even a new Monitor. But it turns out that it's just good old-fashioned Kryptonian physiology to thank for the blast of heat, emanating from Jor-El's one remaining eye (just one drawback of what looks like a fairly serious war wound). DC indirectly spoiled the reveal, or at least gave fans the scent with the reveal of Action Comics#988's cover art, depicting Jor-El taking on a blue, energetic appearance at the moment of Krypton's destruction (Superman's mother Lara isn't so lucky). Clearly, having Jor-El survive the destruction of Krypton is a serious change to the mythology, and one sure to be viewed as heresy by some purists. But the length of time this mystery has been taking shape suggests a worthwhile story is coming, more than a simple shocking reveal. With the post-Crisis Superman merging with the New 52 version, and Jor-El clearly not matching the sculpture behind him in the above panel, expect even more alternate universe/Crisis re-writing incoming. What do YOU make of the reveal? Does this seem like a hook you'll bite, or would you have preferred Mr. Oz to be Ozymandias, given the role of Watchmen in the larger "Rebirth" mystery?